The now-famous catchphrases of “If you’re turned off, turn off” and “If he’s not Mr Right, turn off your light” are amongst many spouted by Paddy McGuiness as he presents Take Me Out, and now you have an opportunity for a luxurious date night on the island of Fernando’s in a slot loaded with bonus features! 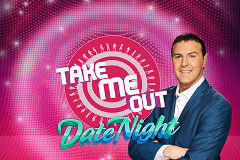 The Take Me Out Date Night slot machine developed by Fremantle is available at some of the most popular UK online casinos and is of course based on the Saturday night dating show that airs on ITV and has proved extremely popular since first splashing onto our screens back in 2010 with over 70 episodes having aired to date and it shows no sign of disappearing! For those of you that haven’t seen the Take Me Out TV show it sees a single man brought down the ‘Love Lift’ to be revealed to thirty single women who each have a button in front of them and a white light that shines brightly. If the women are ‘turned off’ they can turn their lights off (which see them turn red). Three rounds are played which include input from the single man’s friends and family and at the end of them if there are still lights remaining the man is tasked with turning the lights off for those that don’t appeal to him until only one light remains lit – and that is who he is whisked off to the romantic isle of Fernando’s with! You don’t have to have deep pockets for a date night as the Take Me Out slot machine from Fremantle boasts generous stakes enabling all paylines to be active from 20p up to £500 each and every spin – meaning dating can be as expensive as you like. Boasting a very generous return to player percentage of 95.02% RTP, it is an online slot with 5 reels and 20 paylines. The whole design is fantastic with colourful and bold symbols representing the dating theme in a fun manner - however while the opening tune rings out as the slot loads up the sound effects which are usually a staple of Fremantle slots are bitterly disappointing with none of the atmosphere or excitement from the television dating show translating across the reels. Fremantle have done a great job designing the symbols of Take Me Out in a fun and colourful style with thirteen featuring in total. This includes four special symbols which are the Wild represented by the Take Me Out logo which substitutes for all but the Scatters. The other three are needed for their respective bonus games with a Fernando’s symbol, Bring on the Girls symbol, and the famous Love Lift. The other symbols are male and female symbols, big blue lips, Cupid’s bow, plus Ace to 10 playing card symbols. A trip to the romantic island of Fernando’s is what all of the contestants aspire for, but rather than a romantic meal in the sunset it’s big wins that you’ll be lapping up. Triggered by landing three or more of the neon Fernando’s Scatter symbols on the reels, it sees you presented with 10 free spins on a set of reels that see a ‘Super Wild’ replace the standard Wild. This comes with a number attached each time which dictates the number of spins it will stay locked in place for greater winning opportunities. Three or more of the bright pink Bring on the Girls Scatter symbols landing on the reel’s sees five girls strut their stuff to impress you in a straightforward pick ‘em game. Each girl has a bonus prize associated with her which is revealed once you pick one of them – with a video then playing out which reveals the prize that you have won. This time it is your opportunity to impress the girls and hope they keep their lights on. Beginning once you land three or more of the ‘Love Lift’ symbols on the reels, you make your way across the line-up of girls to select one of five charms for each girl. If the girl likes the one you selected you win a prize and advance to the next girl with all charms restored, but if you pick poorly and they dislike them you’ll quickly find your charms disappear – along with your chance of a date! There isn’t much to dislike about the Take Me Out Date Night slot machine from Fremantle. It has a superb design and three highly rewarding bonus features – although the sound effects as the reel’s spin were a little disappointing!